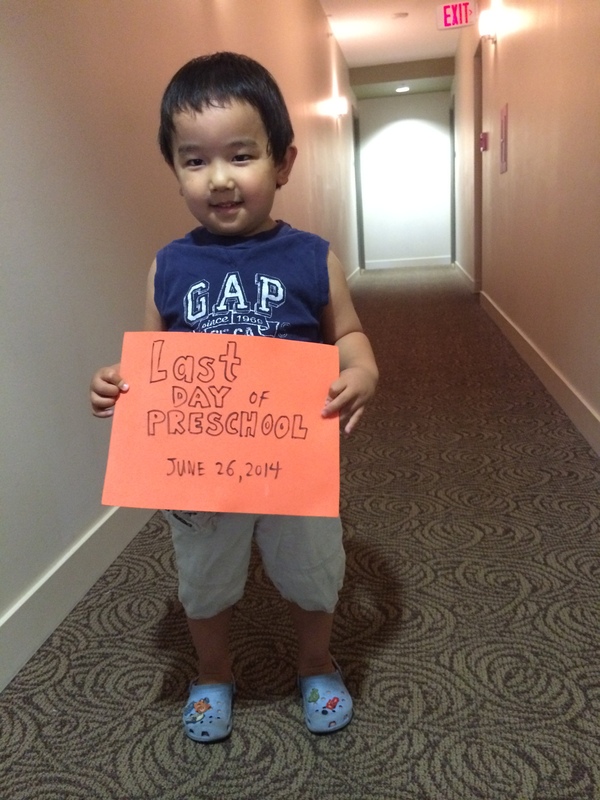 Last day of Preschool, June 26, 2014. 10 months ago, I was taking Joshua to preschool for the first time. If you remember reading the two posts (here and here) related to that first week, I was so worried about how he’ll do. We had never left him on his own before that, ever. It turned out that Joshua loves preschool, and we are so happy that he has his own thing to do that he looks forward to. Because we don’t have him in daycare, he spends the majority of his time with Savanna. I find it’s nice for him to have a few hours a week of being just on his own. Reading my own old posts reminds me of how much he has matured and grown. 10 months ago, whenever he got upset, he would cry and scream and often lose control of his bladder. Over the 10 months, he only had 1 accident. He learned shapes and colors and letters and animals and things I haven’t thought of teaching him. He made friends and he loves his teachers. Preschool wasn’t a big obstacle for him, but it was for me. It was the first time I felt like I had to let him go a little. First day of preschool, September 5, 2013. This entry was posted in Family and tagged Joshua, preschool by angelasaito. Bookmark the permalink.